The Cross Peerless 125 Collection is the culmination of a rich history and development of writing instruments. Developed to celebrate its namesake and the original Peerless pen produced in circa 1889 by the then Cross Pen Company. By combining both modern and classic pen design elements Cross have created a pen range that illustrates the detail that has made the brand legendary. These wide bodied large pens are available in fountain pen, rollerball and ballpoint to suit your writing preference. Choose from several finishes with platinum or gold trim finishes. The fountain pen has a large 18k gold nib. 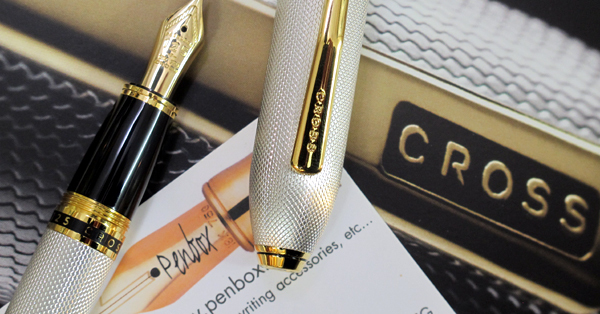 The Medalist Cross Peerless 125 fountain pen. Large sized pen | platinum plated | large 18k nib with "125" inscription and chassing | uses ink cartridges or fills from an ink bottle | gold plated trim | barley corn | medalist finish | faceted black Swarovski crystal inset into the cap top | screw on cap | presented in a high end hinged gift box. Medalist Peerless rollerball pen from Cross. Medalist Cross Peerless ballpoint pen. The Peerless 125 is an oversized pen for those who prefer a larger writing instrument.